The castellated ACB® and Angelina™ beams, with their circular and sinusoidal web openings, elegantly combine function with flexibility. Alternatives to trusses and open-web joist systems, castellated beams are lightweight, long-spanning, structural elements that enable the design of vast column-free spaces. They can be used in composite or non-composite systems. Their web openings permit installation of mechanical, electrical and plumbing (MEP) pipes and ducts within the depth of the beam, thereby allowing for compact ceiling systems and maximized floor-to-ceiling heights. In addition, the repetition of the perforations ensures that variations, during construction or throughout the life of the structure, in the layout of the MEP system can easily be accommodated. Architecturally striking, castellated ACB® and Angelina™ beams are every year seeing increased use in the built environment. Today, with improvements that have been implemented in design standards, analysis tools, and manufacturing, it is easier than ever to incorporate them into a framing system. Eurocode 3 for steel structures and Eurocode 4 for composite structures provide guidance with respect to the design of castellated beams. 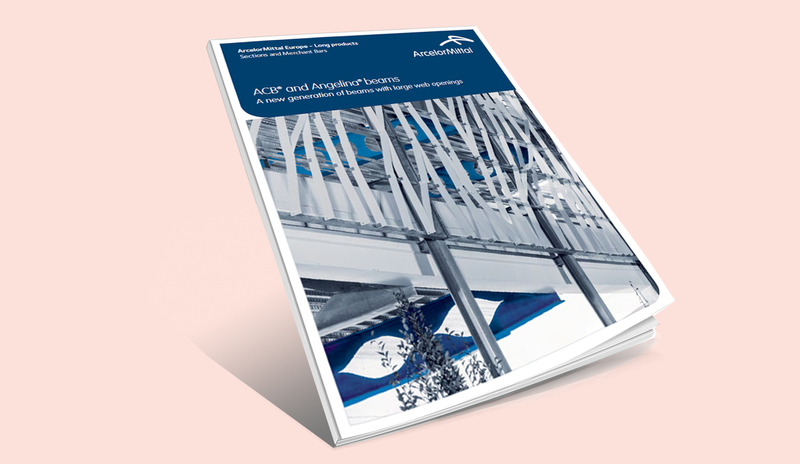 Information includes analysis recommendations for use of these elements in traditional applications, such as the support system for floors and roofs; assumptions to employ when considering how the sections will behave in response to fire events; and information about using castellated beams fabricated from S460 high-strength steel. 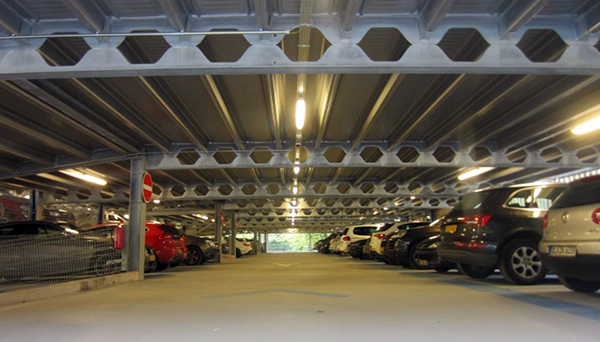 The development of the various aspects of composite steel and concrete construction – connections, use of steel sheet decking, large floor areas without expansion joints (up to 80m and even more), fire resistance, user comfort and durability – has greatly contributed to the ACB® and Angelina™ beams solution in floors. To facilitate easy analysis of castellated beams, two software systems have been developed and made available to structural design firms and architects: ACB+ and ANGELINA. These tools take into account Eurocode design principles as well as results of full-scale tests and numerical simulations. With ACB+ and ANGELINA, users can determine optimal system weights, based on section size, opening depth, width and distance and determine the impact that varying steel grade will have on the solution. These systems are designed to assist engineers and architects in finding the most efficient, economical castellated beam solutions. Optimised manufacturing methods, including flame cutting and bending, enable cost-effective production of ACB® and Angelina™ beams, even as they are customized to meet individual project needs. In addition, efficiency of production leads to quick release of the sections for final fabrication. Castellated ACB® and Angelina™ beams are created from a standard hot-rolled steel section. The length of the beam is established based on the framing layout in the structure. Dimensions that define the shape and layout of the openings – i.e. 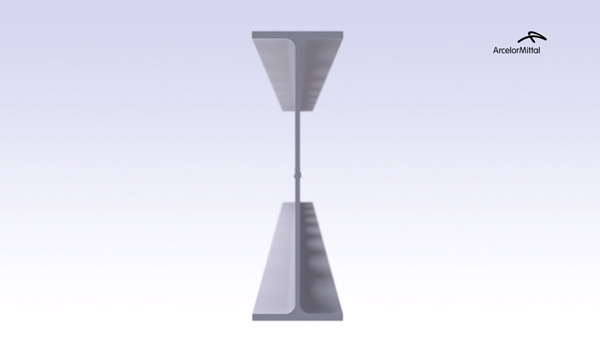 a0 (diameter or height of opening), s (length of sinusoidal curve), and w (length of the intermediate web post) – are governed by strength and serviceability requirements and are verified by the designer. Cofraplus® 220 combines the outstanding resistance of the patented steel profile with the performance of a ribbed reinforced concrete slab. The total load bearing capacity results as the sum of the resistance of both elements, as no composite action is taken into account. The high values of moment of inertia and moment of span guarantee large span without propping. Cofraplus® 220 sheets are available with thicknesses of 1, 1.13 and 1.25 mm, with a maximum length of 9 m.